Greek salad is a salad in Greek cuisine that is known in Greece as “horiatiki” (village salad or rustic salad). Main ingredients in a Greek salad are tomato, cucumber, onion, feta cheese and Kalamata olives, seasoned with salt and oregano and drizzled with olive oil. A variation of the salad also includes capers. In some countries, including the United States of America, the United Kingdom and Australia, the term refers to a salad made with lettuce and inspired by ingredients typically found in Greek cuisine. 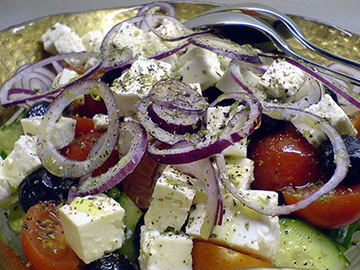 American – style Greek salad, apart from lettuce, tomatoes, feta and Kalamata olives, also uses pepperoncini, bell peppers, dolmades and anchovies, among other ingredients. Dressings are also used in such salads instead of olive oil, which is extremely uncommon within Greece. An example of a Greek - inspired salad is the Greek bean salad, which is made with beans, tomatoes, feta cheese, cucumbers, onions, and red and green bell peppers. Other salads in Greek cuisine also include lettuce salad with onion and dill, cabbage salad with olive oil and lemon juice, beetroot salad with olive oil and vinegar, sometimes adding Greek yogurt as well, potato salad with olive oil, onions and lemon juice, and politiki salad, finely sliced cabbage and carrot dressed with olive oil and vinegar.